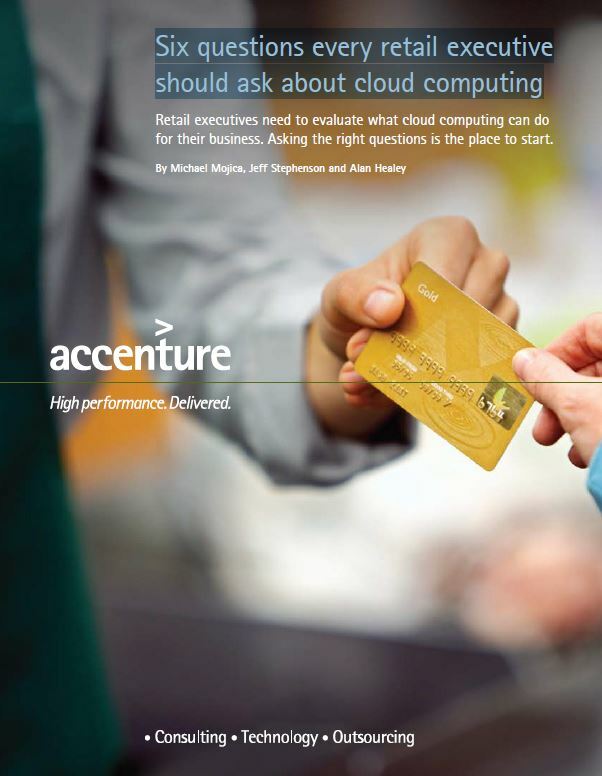 A very informative whitepaper from Accenture on cloud computing for retail. 1. What cloud computing is and how it works. 2. What benefits the cloud can bring to your retail business. 3. How the cloud can help address specific changes faced by your business. 4. Whether you can depend on the cloud to save money. 5. How the cloud will affect the way your business operates in the future. 6. About security and data privacy. ‘The retail industry’s migration to cloud: not a question of ‘if’ but ‘when’. Categories: Convenience retail, Convenience retailing, Retail systems, Retail technology, Software for retail, Software retail | Tags: cloud, cloud computing, retail, retail business, retail industry, save money | Permalink. 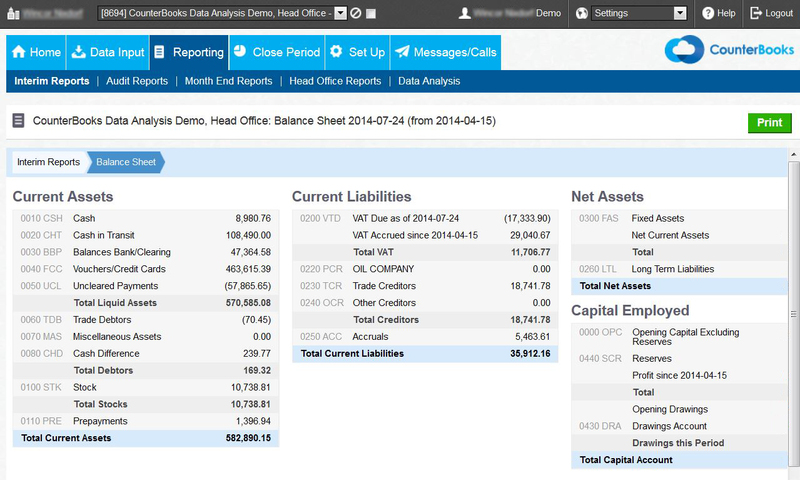 Categories: cloud computing, saas accounting, saas computing, Software for retail, Software retail | Tags: accounting, API, Application Service Provider, applications in the cloud, ASP, cloud computing, Finance, Iaas, Infrastructure as a service, mobile, Paas, Platform as a service, reduce costs, SaaS, software-as-a-service, the cloud | Permalink. Time and time again, I speak with soon-to-be franchisors in the early stages of setting up and not investing in the right technology. In the mid 2000s, with the help of a great team, we built a franchise network from conception to national brand within 4 years, we introduced many initiatives and the toughest ones, without a doubt, were IT projects. It is absolute critical from the outset to have a robust and scalable technology platform prior to recruiting franchisees. Maybe 10 years ago, franchisors could argue that the costs involved in IT projects were prohibitive, however with the availability of cloud deployed technology – there is no excuse. Cloud deployed software is highly scalable due to the pay-as-you-go subscription model (typically per user or per company) and requires minimal capex/upfront investment. In my humble opinion, executives very often get caught up in the more exciting aspects of franchising, recruitment, marketing and attending franchisees launches. Those of you which have written a full Request for Proposal (RFP), can probably relate, it is a horrendous task. However it can have profound implications on the franchise system if the appropriate systems and processes are not in place from conception. Every time a franchisor recruits a franchisee without the right systems, they are compounding the complications which lay ahead. People rarely like change, and introducing a new IT system even less. 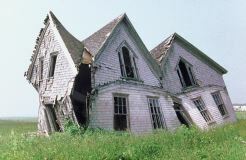 Newly launched franchisees should be focused on building their business, not have their time and attention being diverted for the launch of a new IT system – this can have repercussions which can lead to conflict and difficulties early on within the honeymoon period of the franchise relationship. A new IT project will present the franchisee with additional costs. They might be at the early stages of their growth and might not yet see or understand the logic for the project as they are yet to experience the “challenge” the new system intends to solve – therefore making it more challenging to introduce the system. Introducing new systems in a wholly owned company can be awkward, when introducing a new system in a franchise network, it presents an additional layer of complexity. You will need to engage with the franchise network, explain the issues, consult with the network as a whole (and/or the franchise council), draft a specification, engage again with the franchise network for user acceptance testing, arrange training, and ensure effective roll out. All of which can be avoided. So all in, it costs more, consumes time from the franchisee and franchisor and can be a challenge which will involve project management and change management skills. Many IT projects are reactive, they are intended to solve a problem which has already presented itself and the business has “felt the pain”. For example, if there is an increase in the franchisee failure rate, this is because the franchisor has an inadequate management information system to effectively monitor franchise performance. With hindsight, had the franchisor introduced a cloud based “Management Information System” at the early stages of growth, they would have potentially avoided the failure of those franchisees, whilst having the opportunity to monitor franchisees through this critical growth stage to refine the model and provide better support. Having technological competencies can deliver dual competitive advantage. A highly automated accounting back office can deliver competitive advantages through reduced costs and time, therefore allowing the franchisee to focus on delivering a better service and invest in the business. This competitive advantage provides the franchisor with an improved customer experience which can attract talented franchisees. Are all systems suitable for franchisees? What other systems will be required to support the franchise management team and the franchisees? Can the systems scale in line with your growth objectives? We would love for you to share some of your experiences, good and bad. Categories: Franchising, Retail systems, Retail technology, saas accounting, saas computing, Software for retail, Software retail | Tags: accounting, automated accounting, cloud, cloud deployed software, cloud deployed technology, franchise channel, franchise network, franchise performance, franchise relationship, franchise system, franchisee, franchisees, franchising, franchisor, franchisors, It system, minimal capex, pay-as-you-go subcription model, Request for Proprosal, technology | Permalink.